We’re effectively the home of BA’s long haul fleet, where we maintain and look after the long haul aircraft. We employ just under 1,000 people at our site in Cardiff. We’re beginning to move away from maintaining our legacy aircraft and preparing for looking after the next generation of aircraft and that presents us with some really big challenges in terms of technical and training capabilities and making sure our engineers continue to remain at the cutting edge. We identified, probably about 4 years ago, that to ensure our long-term prosperity and to ensure that we will be able to provide a competitive maintenance service back to our airline into the future (next 10, 15, 20 years) we needed to transform our skills and experience. For example, simple things like the way we conduct repairs to the aircraft and the challenges around things like fibre optics, avionics, hydraulics, that’s all moved forwards from a technological standpoint and we really needed to sit back and ask how we prepare our engineers. There will be a period when our engineers are looking after the older generation of aircraft and the newer generation of aircraft which will require quite a mix of skills. It was from a networking opportunity that I met with members of the University of South Wales, at the opening of the University’s aerospace centre. I was just really impressed with what they’d done in such a short space of time and the approach they were taking to things like practical hand skills, tool control, skin repairs etc. and I thought that this is really something that we should be exploring. Of course, we felt quite strongly that we had a responsibility where the university is trying really hard to support us as a sector so we need to be doing our bit. I guess we had some aspirations. We were looking for someone who would work with us in terms of developing new skills and techniques to work with the new technology that we knew would be heading our way. We didn’t have any preconceived ideas about what that might look like. The university were very open minded around potential options, in terms of what we could do, what we could look at – from the length of courses to general research and development (R&D). One of the most positive things in terms of the overall relationship is that the University of South Wales has been extremely open minded about the challenges that we face and how they could work with us from a partnership standpoint to overcome those challenges. If we were to approach the University tomorrow to say we have a challenge and what can you do to work with us and help us, I am very confident that they would be able to react to that. And indeed, more recently we’ve been looking at how we do more R&D and the University has been very positive about working closely with us and are very keen to explore new practices and techniques for the repair of aircraft using composites so I’m quite excited by that. We are engaged with people right across the University – from the course tutor, to the Vice Chancellor. We’ve got healthy regular contact. University of South Wales is a fundamental part of our strategy in terms of the talent pipeline going forward. 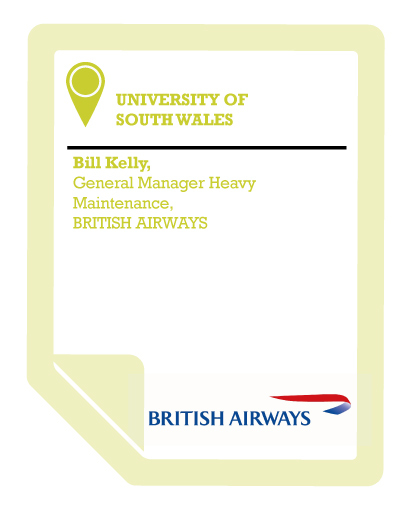 I would tell other employers to engage with the University of South Wales at their earliest possible opportunity. The University has a refreshing approach and style, they are highly motivated, very positive and the management and leadership absolutely get the challenges that our businesses face in a very competitive market place. They embrace that challenge with us to come up with some real, practical and tangible solutions to ensure our people of the future have the right skills and experience and are developed in the right way to make sure that we are prosperous into the future, irrespective of the business that we’re in.